Philanthropist and businesswoman Madeleine Pickens was joined today by the million-member ASPCA, the American Wild Horse Preservation Campaign, and many other organizations expressing their outrage over the deaths of at least seven mustangs in a Bureau of Land Management (BLM) roundup conducted Saturday in the Owyhee Complex in northeastern Nevada. The wild horses died of dehydration-related causes—including brain swelling, colic and acute water intoxication – as a result of being stampeded by helicopters for up to eight miles in 90+ degree desert heat. The crackdown on public observation comes in the wake of public outrage and international media coverage of the Calico roundup, which ended in February. 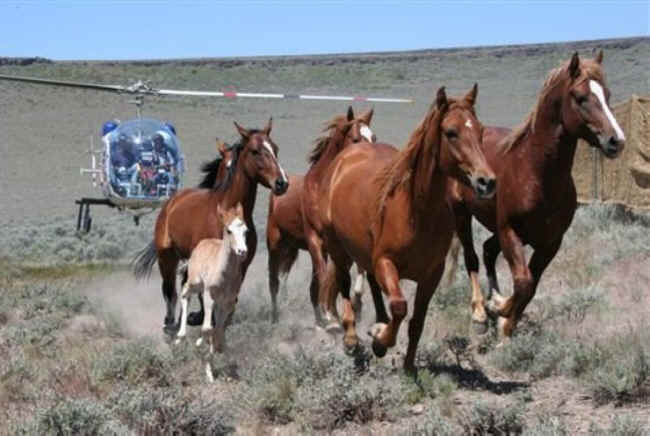 The controversy was fueled by release of photographs and video showing of wild horses, including young foals, heavily pregnant mares and older horses, being forcefully driven by helicopter out of the mountains of Nevada and into BLM trap pens. “The BLM’s crackdown on public observation of roundup activities is unacceptable, and makes a mockery of President Obama’s stated commitment to open government and transparency in government operations,” added Suzanne Roy, Campaign Director of the American Wild Horse Preservation Campaign, whose grassroots efforts are endorsed by a coalition of more than 40 horse advocacy, animal welfare, conservation and historic preservation organizations. Other coalition supporters signing the letter include Mrs. Pickens’ Saving America’s Mustangs Foundation, The Cloud Foundation, Lifesavers Wild Horse Rescue, Return to Freedom, American Wild Horse Sanctuary, Animal Welfare Institute, and In Defense of Animals. The BLM wild horse program has been harshly criticized for its lack of fiscal sustainability. The agency now stockpiles more wild horses in government holding pens and pastures (36,000+) than are left on the range (<33,000). The cost to taxpayers for this program is expected to exceed $70 million next fiscal year. Wild horses comprise a small fraction of grazing animals on public lands, where they are outnumbered by livestock nearly 50 to 1.